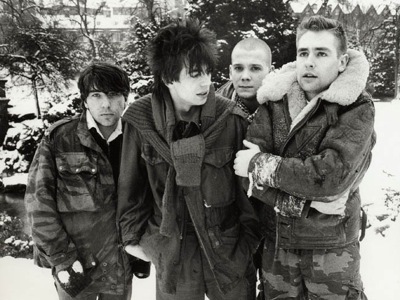 Echo & the Bunnymen are a British post-punk band formed in 1978. The original line-up consisted of Ian McCulloch (of The Crucial Three), Will Sergeant and Les Pattinson. There are many stories, probably apocryphal, that the quartet was completed by a drum machine known as “Echo”. By the time of their debut album, 1980’s Crocodiles - a moderate UK hit - the drum machine had been replaced by Pete de Freitas. Their next, the critically-acclaimed Heaven Up Here, reached the Top Ten in 1981, as did 1983’s Porcupine and ‘84’s Ocean Rain. Singles like “The Killing Moon” (later used in the soundtrack to Donnie Darko, a film whose imagery owed much to the artwork of the band’s early records. ), “Silver,” “Bring On The Dancing Horses,” and “The Cutter” helped keep the group in the public eye as they took a brief hiatus in the late 1980s. Their 1987 self-titled LP was a small American hit, their only LP to have significant sales there. McCulloch quit the band in 1988. De Freitas was killed in a motorcycle accident one year later. The others decided to continue, recruiting Noel Burke to replace McCulloch on vocals in Reverberation (1990), which did not generate much excitement among fans or critics. Burke, Sargeant and Pattinson split after that, but the surviving three fourths of the original band reformed in 1997 and released Evergreen (1997), What Are You Going To Do With Your Life? (1999), Flowers (2001) , Siberia (2005), and the latest addition, The Fountain (2009). The group’s old audience liked the return to their classic sound, and they also managed to gain a number of new, younger listeners. In 2002 the group received the Q Inspiration award. The award is for inspiring "new generations of musicians, songs and music lovers in general." The band were said to be worthy winners as they have done much to promote the Mersey music scene. In a later interview for Magnet magazine, McCulloch said "It validates everything that we've tried to achieve—cool, great timeless music. It's not like an inspiration award affecting the past, it's affecting the current music." On 11 September 2006, Echo & the Bunnymen released an updated version of their 1985 Songs to Learn and Sing compilation. Now re-titled More Songs to Learn and Sing, this new compilation was issued in two versions, a 17-track single CD and a 20-track version with a DVD featuring 8 videos from their career. In March 2007, the Bunnymen announced that they had re-signed to their original record label, Warner, and were also working on a new album. The band were also said to be planning a live DVD, entitled "Dancing Horses", which also contained interviews with the band. This was released in May 2007, on Snapper/SPV. 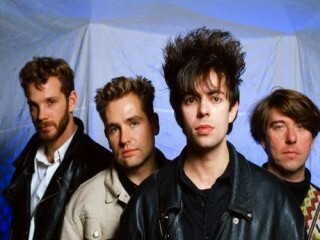 The live line up was Ian McCulloch, Will Sergeant, Simon Finley (Drums), Paul Fleming (Keyboards), Gordy Goudie (Guitar) and Steve Brannan (Bass). On 11 January 2008 Ian McCulloch was interviewed on BBC Breakfast at the start of Liverpool 08. He was asked about new Bunnymen material and he revealed that a new album would coincide with their gig at the Royal Albert Hall in September. He went on to say that the album was, "The best one we've made, apart from Ocean Rain." In a 20 April 2008 interview with the Sunday Mail Ian McCulloch announced The Fountain as the title of the new Echo & the Bunnymen album with producers John McLaughlin and Simon Perry,which was originally due to be released in 2008 but was finally released on 12 October 2009. The first single from the album, "Think I Need It Too", was released on 28 September 2009. On 1 September 2009 former keyboard player Jake Brockman died on the Isle of Man when his motorbike collided with a converted ambulance. Brockman had played keyboards for the band during the 1980s. In December 2010, Echo & the Bunnymen went on tour playing their first two albums Crocodiles and Heaven Up Here in their entirety.